Soak the vermicelli noodles in hot water for 3 minutes until they have separated. Drain them and leave to dry on a clean tea towel for 10 minutes. Finely slice the onion, red pepper and spring onion. Put the prawns in a small bowl or ramekin. Mix the spice and sauce ingredients together in separate ramekins or bowls. BUILD YOUR WOK CLOCK: place your egg at 12 o’clock, then arrange the onion, pepper, prawns, bean sprouts, noodles, spice and sauce bowls and lastly your spring onion clockwise around your plate. Now push the egg to one side of the wok to allow space for your veg and heat until smoking-hot (you may remove the egg from the pan if you feel more comfortable or have a small wok and need the space). 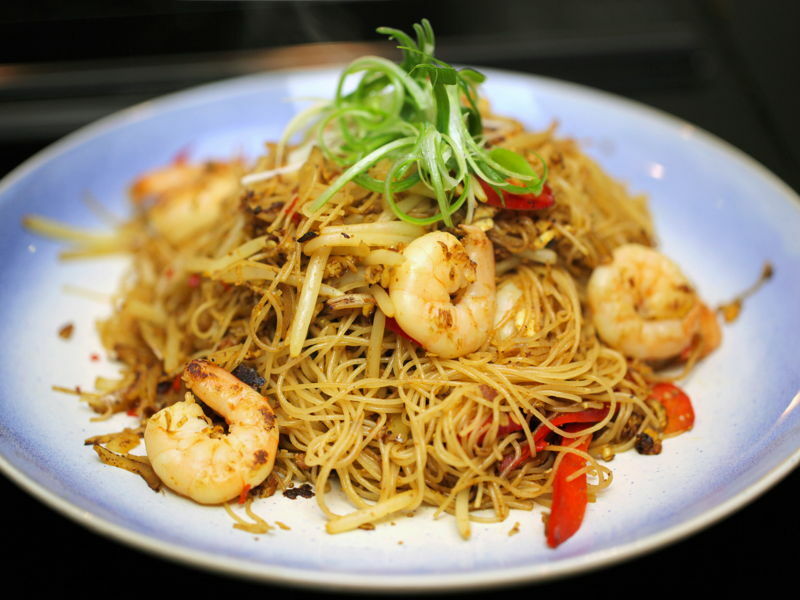 Once smoking-hot, add the onions and peppers and stir-fry for 1 minute, then add the prawns and stir-fry for a further 30–60 seconds until they are lightly browned. Add the bean sprouts to the wok and stir-fry for another 20–30 seconds, then add the noodles and stir-fry for 1 minute before stirring in the spice mix and pouring over the sauce. Continue to cook, stirring, until the ingredients are thoroughly combined and the noodles have dried out a little and are just starting to stick to the bottom of the wok. Serve in a large bowl and scatter over the spring onion to finish. TIP: If you feel the wok is looking a little dry between the addition of ingredients, push everything to one side with a spatula and add an extra ½ tablespoon of oil to the wok. Let the oil heat until smoking before adding the next ingredient. Note – you should never need more than 2 tablespoons of oil for one stir-fry.